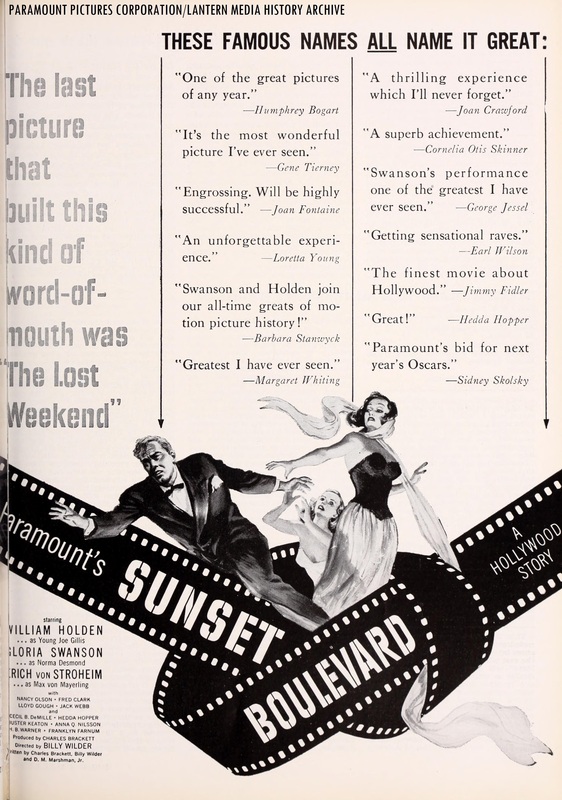 Original Paramount Pictures theatrical trailer for “Sunset Boulevard” (1950). With an ensemble cast and several cameo appearances by familiar silver screen personalities, you will not want to miss out Turner Classic Movies’ “Big Screen Classics” revival showcase of Billy Wilder’s “Sunset Boulevard” (1950). Whether you have seen Wilder’s drama/film noir masterpiece many times in earlier revival screenings, on TV or if this will be your first time experiencing the 1950 cinematic gem, be sure to see it on the silver screen at your nearest local cinema venue! To find the nearest cinema location in your hometown (that will be participating in Turner Classic Movies’ revival screening of “Sunset Boulevard”), type in your zip code on the official Fathom Events site. Questions/Comments about the upcoming “TCM Big Screen Classics” revival screening of “Sunset Boulevard” (1950)? Drop a line at the comments section!